The fear of the LORD is the beginning of wisdom: a good understanding have all they that do his commandments: his praise endureth for ever (Psalms 111:10). The fear of the LORD is the beginning of wisdom: and the knowledge of the holy is understanding (Proverbs 9:10). 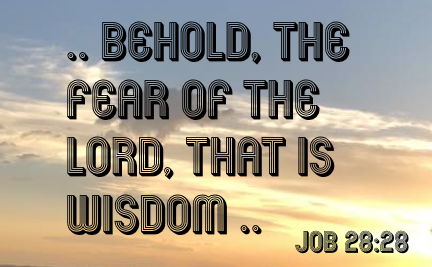 What is the "Fear of the Lord"
When the word "fear" is used pertaining to the Lord, it takes on the third meaning of the Gesenius' Hebrew-Chaldee Lexicon i.e. reverence, holy fear. When we use the word wisdom today in the world, we are talking about "the how to". We might have all the knowledge; "the what, the where, the when, the how much", and the understanding; "the why", but if we don't have the wisdom of "how to", we still can't proceed "wisely". No wonder people everywhere fear him. All who are wise show him reverence (Job 37:34 NLT). 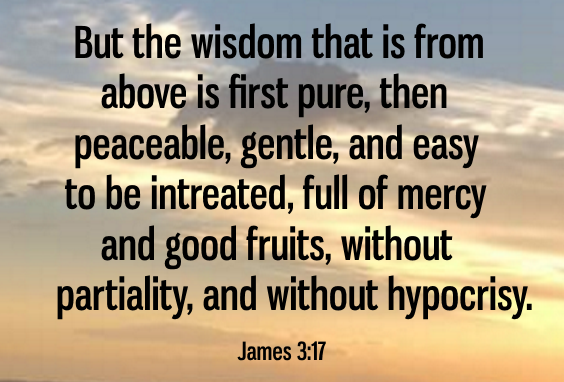 But the wisdom that is from above is first pure, then peaceable, gentle, and easy to be intreated, full of mercy and good fruits, without partiality, and without hypocrisy (James 3:17). Most of the time God speaks to me though is through reading and studying the Word of God, through hearing preaching or teaching of the truth of the Bible, and by God answering prayer. And after the earthquake a fire; but the Lord was not in the fire: and after the fire a still small voice. And it was so, when Elijah heard it, that he wrapped his face in his mantle, and went out, and stood in the entering in of the cave. And, behold, there came a voice unto him, and said, What doest thou here, Elijah (1 Kings 19:12-13). and Jesus is the Holy Ghost (see Jesus is God, Rest in Jesus and the Wheel of Prophecy). As we learn to listen to the Holy Ghost, God will fill us with wisdom that will exceed any expectation that we may have. It doesn't take much thought to conclude if God wrote the Bible, albeit using men that He inspired, how can every verse not contain wisdom from the Creator? Then we have 222 verses in the Bible that actually contain the word "wisdom". If you would like to study these verses, go here. 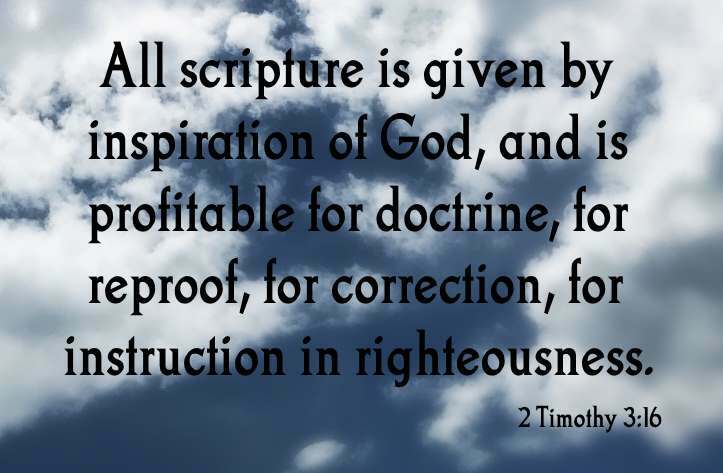 If we want our lives full of Bible wisdom, we just need to go to the Holy Bible. For rebellion is as the sin of witchcraft, and stubbornness is as iniquity and idolatry. Because thou hast rejected the word of the Lord, he hath also rejected thee from being king (1 Samuel 15:23). As you have just read, when the man of God gives us instructions that come from the Lord and we are not obedient, it is akin to being rebellious and is a sin of witchcraft and stubbornness which is like iniquity and idolatry. Consequently Saul was rejected by God. Read the entire account of Saul's self-destruction in 1 Samuel 15:1-35. How then will they call on him in whom they have not believed? And how are they to believe in him of whom they have never heard? And how are they to hear without someone preaching? And how are they to preach unless they are sent? As it is written, “How beautiful are the feet of those who preach the good news!” But they have not all obeyed the gospel. For Isaiah says, “Lord, who has believed what he has heard from us?” So faith comes from hearing, and hearing through the word of Christ. (Romans 10:14-17 ESV). And to you who are troubled rest with us, when the Lord Jesus shall be revealed from heaven with his mighty angels, In flaming fire taking vengeance on them that know not God, and that obey not the gospel of our Lord Jesus Christ (2 Thessalonians 1:7-8). Prayer is a priceless way to get wisdom directly from the Lord, especially when we pray in the name of Jesus Christ. When we pray, we need to listen as well as talk. When we actually listen, we will be able to hear the wisdom, the guidance, the direction, the "how to" that He is giving us. In Acts 10, there are two examples of this happening. First, God tells Cornelius that his prayers have come up for a memorial (Acts 10:1-4). Cornelius gets precise direction and he is obedient (Acts 10:5-8). Then about the same time that Cornelius's men arrive in Joppa, the Apostle Peter is praying and God gives him a vision with specific instructions as well (Acts 10:9-20). Peter obeys God's direction (Acts 10:21-23) and goes to Caesarea with Cornelius' men. They in turn explain the direction that God had given them (Acts 10:24-34). Wisdom comes together from here. Peter had the wisdom to preach the gospel of Jesus Christ to the Gentiles based on the direction God gave him when he was praying in Joppa. There is absolutely nothing wiser than preaching this precious and loving Gospel (Acts 10: 25-43) - the "how to" to be saved. Cornelius and his household had the wisdom to believe the preaching. All of Cornelius' household were filled with the Holy Ghost with the evidence of speaking in tongues (just like the Jews that were present in Cornelius' house had experienced) and then were baptized in the name of Jesus Christ. 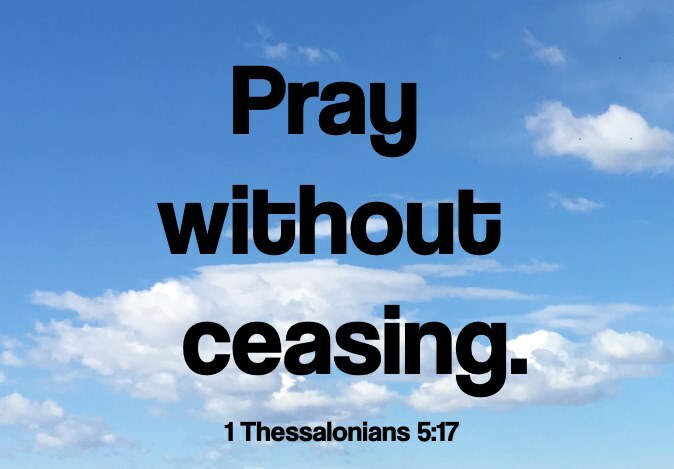 Pray without ceasing (1 Thessalonians 5:17).